This deal is back and cheaper than ever before. At just $199, this is a solid deal on a big ol' tablet...thingy. Samsung has a giant tablet for grownups, but it doesn't seem to be a hit. 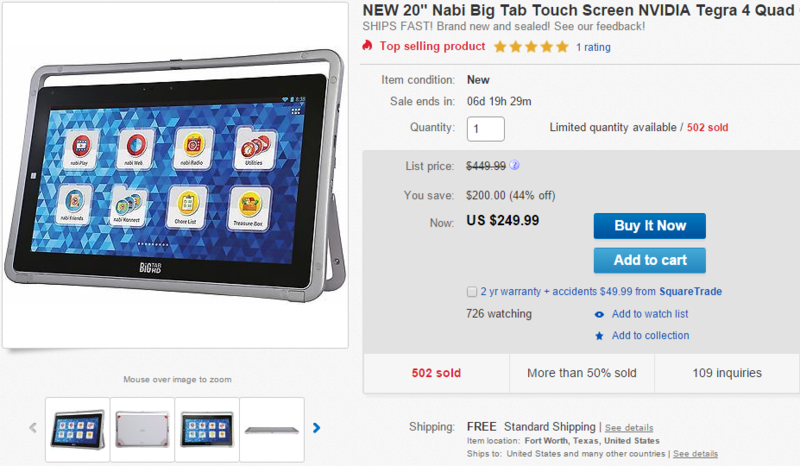 The Nabi Big Tab for kids is pretty popular, though. The 20-inch variant usually sells for $300, but it's on sale for $250 via eBay right now. The sale is good for a few days, but there is a limited supply and a few hundred have already sold. The Nabi Big Tab has a simplified UI mode for kids with a wide array of parental controls and special apps. It has a full version of Android under the hood, so you've got access to all the family-friendly apps in the Play Store. Inside is a Tegra 4, 2GB of RAM, and 16GB of storage. While the screen is 20-inches, it has a resolution of 1600x900. It might not look the best, but it's for kids. This deal is more than 50% gone already, so don't think it over too long. It includes free shipping in the US and charges tax only in Texas. You can get it shipped internationally too if you're willing to pay for it.